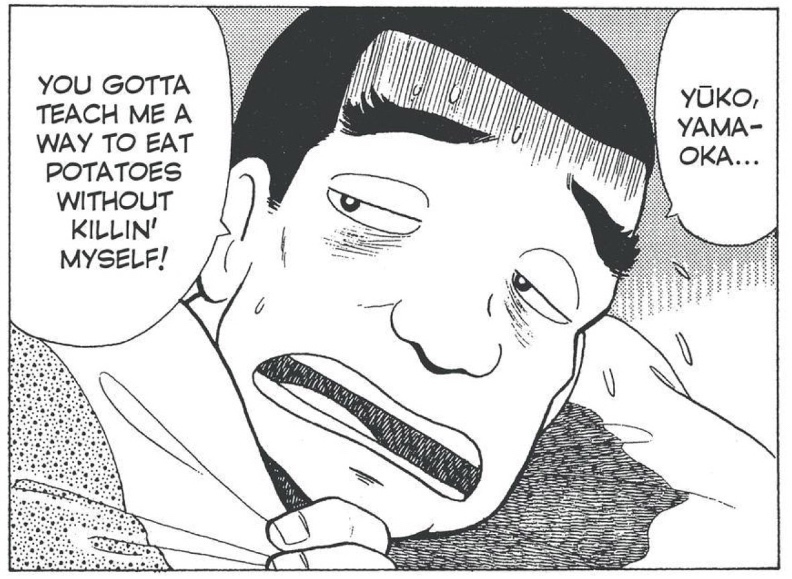 Oishinbo: Izakaya | Yeah nah. Oh, and some food created by a homeless gourmand? And some headhunting? And a relationship-fracturing food fight? And the choice of educational pathways? And the birth of some children? All this and more, y’see. And all under the auspices of the izakaya: something like a pub, but not really. It’s kind of odd but perfectly appropriate that the final volume focuses on beer and snacks, because a snacking modus is exactly Viz has approached these volumes: placing bits and pieces together in loose assembly to provide easily digestible enjoyment. This volume featured a lot more of Yamaoka’s personal life – hell, interpersonal relationships in general – than other volumes did, even though the ever-present battles with his father, Kaibara, were kept to a minimum. 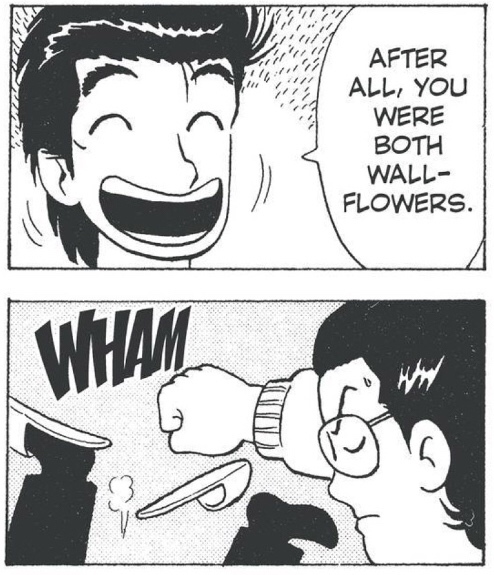 It’s also where the biggest effects of Viz’s chopping together of stories from across the whole run of Oishinbo became much more apparent. 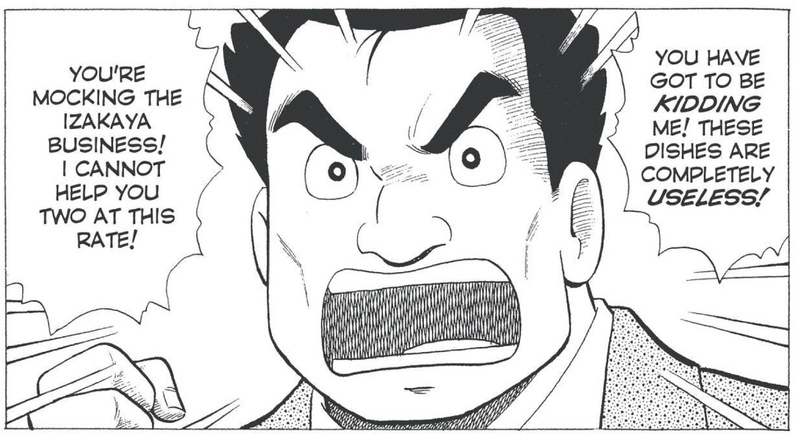 One of the key stories in here is about the naming – appropriate or no – of two kids that Yamaoka and Kurita have had. 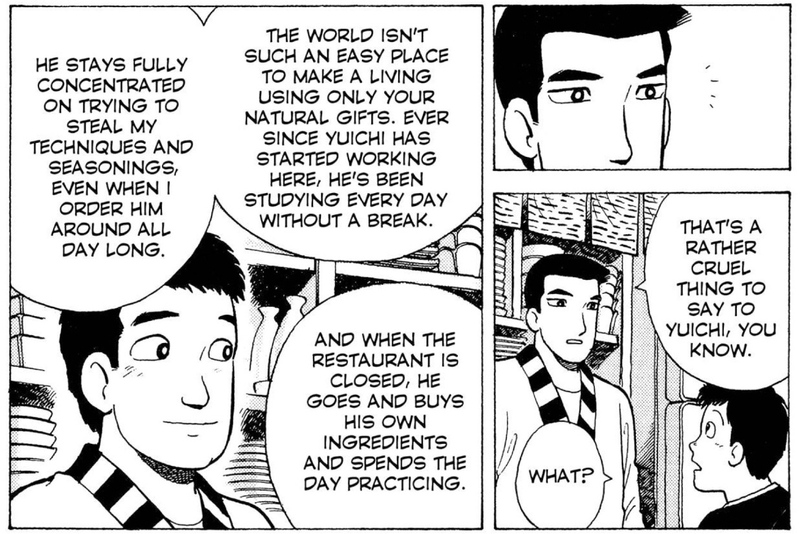 Which is cool, except for the fact that only a couple of pages earlier, we’re shown a story in which a rival firm attempts to have Yamaoka marry into their family in order to snare his culinary skills. Well, Seymour, you are an odd fellow, but I must say you steam a good ham. Huh? Yeah. It’s jarring, and lessens the emotional impact of baby-heavy story, which is about naming kids in a way that will send them through life with a good direction. That’s a very specific request. The pesticide warnings of the past two volumes have been passed over here in favour of – as you’d expect – stories about working hard. About how one’s behaviour and responsibilities are intertwined. And as before, the views of cultural outsiders are taken into account. Work is hard, but it’s important to play, too. Because the playful approach – not something as acceptable as the buckling down of some of Yamaoka’s coworkers – is not considered viable, even though it’s a necessary part of developing new ideas. Don’t come to Okinawa unless you’re prepared to play, son. It’s a bit strange to say that food, while present in the volume, isn’t really the focus of the stories assembled here. Instead, it’s something that facilitates the experiences described; it drives the narrative, but is not given the microscopic focus, for the most part, that it’s had in earlier volumes. HAVE RESPECT FOR MY WHIPPING BOY, KID. 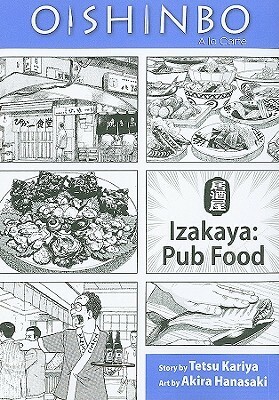 I suppose it’s fitting that the end of the series is something as nebulous as izakaya food. Pub food. Comfort food. Something that’s often considered a snack but is really something more, because the izakaya is something more than just a place to get pissed. It’s where hair is let down, a staging post that often becomes a final destination. A place where people are authentically themselves, bleeding off the pressure of the day. Somewhere that the rigid idea of appearances and what should be done – a constant feature of these volumes – is let go for a moment. 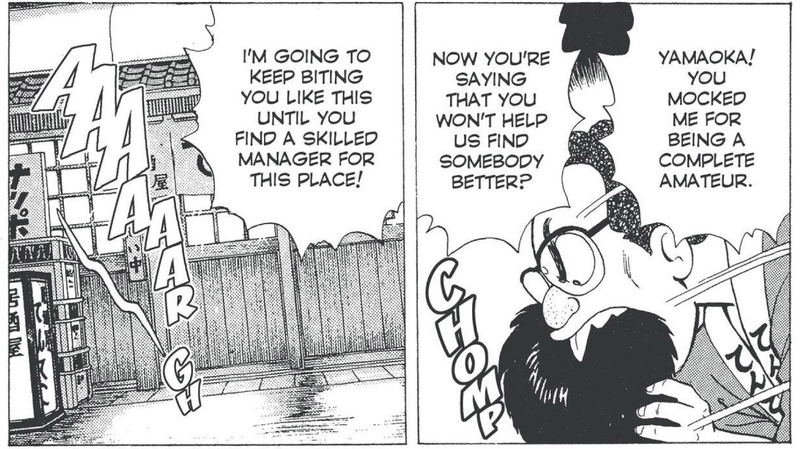 The izakaya is where you’re supposed to escape this sort of management. It makes sense because nailing down ‘Japanese cuisine’ is an impossible task, as the first volume showed: it’s about a feeling more than an end product. And so it goes with the izakaya. As the characters discover – yes, even food geniuses – it’s easy to underestimate the place, but hard to explain why. 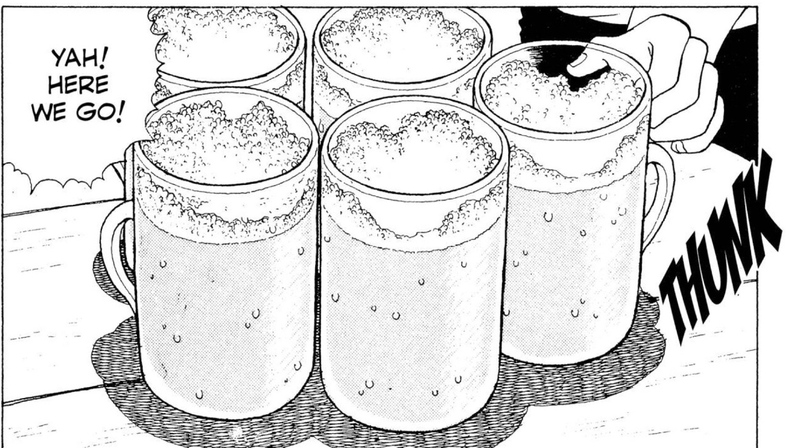 But it’s fitting that the series which began with an examination of what makes something Japanese ends – in English, at least – with a stop at a place that allows pause in the tasks involved with being Japanese. Was it a bit of an anticlimax to find that beer and edamame were the final stops of this series? The tomes that’ve involved precise culinary genius? Maybe. Was it disappointing that the father-son rivalry never moved from its starting position? Undoubtedly. But did I regret sticking it out, despite the clangers within? Not at all. I just wish there was more.